The dice were in my head forever; but recently I stopped worrying about it. Then why is your rank the same? I was colonel for 3 straight yrs a long time ago. So i am capable of having a higher rank if I put my mind to it. gannable wrote: I was colonel for 3 straight yrs a long time ago. The beating just doesn't let up! I think it's been nine weeks now. I was listening to CBC radio last night, and heard the story of Tsutomu Yamaguchi. Mr. Yamaguchi was an engineer working for Mitsubishi Industries, and he was assigned to the shipyards at Hiroshima, where, on August 3rd, he survived the atomic bomb. Badly burned, temporarily deaf, and suffering from radiation sickness, he was nonetheless in better condition than many people in the city. He decided to make his way home to see his family. Along with some other survivors, he made his way to a train station where the trains were still running and got a train home. Back in his home town, he reported to the offices of Mitsubishi, where he tried to explain his experiences in Hiroshima. His boss told him it was implausible that one bomb could do so much damage and called him crazy, at which point a second atomic bomb detonated. Yamaguchi's home town, you see, was Nagasaki. Talk about out of the frying pan and into the fire! Yamaguchi survived that one also (although he did suffer terrible pains and disfigurement) and eventually lived to the age of 75. The incredible story of someone escaping from Hiroshima and rushing home to Nagasaki really helped put my own troubles into perspective. I resolved to stop bitching about the dice. Dukasaur wrote: I was listening to CBC radio last night, and heard the story of Tsutomu Yamaguchi. Mr. Yamaguchi was an engineer working for Mitsubishi Industries, and he was assigned to the shipyards at Hiroshima, where, on August 3rd, he survived the atomic bomb. Badly burned, temporarily deaf, and suffering from radiation sickness, he was nonetheless in better condition than many people in the city. He decided to make his way home to see his family. Along with some other survivors, he made his way to a train station where the trains were still running and got a train home. Start second in all 5 games in my own tournament. Set up to win 3-2 despite that. In one game, I roll 18v15 which ends 3v12. That gives the opponent a chance to get back in the game, especially when he follows up with a 3 card cash. Little later in the same game an 11v3 fail seals my fate. Another game, I have 15v3 and roll it with just 3 left needing to take 2 singles to win the game. Before that I had a chance to end the game 7v2 but failed that. That game is now over and a loss too. I'm knocked out of the tournament 1-4 thanks to the wonderful 50k dice loop system which still hasn't been improved or replaced no matter which prick says otherwise. I appreciate your philosophic and introspective approach. Whoever, to follow your train of thought it, ultimately, is foolish and actually reprehensible for us to even be online playing a silly game. But we are here. Because it’s fun. Often. But the maths paid for to run the out come of rolls, as you well know, is way out of line from a practical enjoyment point of view. I’ve always maintained this: charge me more but give me a better experience. Forge of Empires did it in their battle program. Clash of Clans? Of course. Any worthy poker/gambling site. Phssst. From their beginnings. So? Buy a better math. Charge me more money. I’ll not disappear in a fortnight and you will ultimately make more money. Teegee- die usually have opposing sides that add up to 7. 1 and 6 on opposite sides, for example. 2 and 5 on opposite sides. 3 and 4 likewise. Your post has a t-shirt where 3 and 4 are on adjacent sides on one die, and 6 and 1 adjacent on the other. That's weird. It doesn't necessarily mean the dice on the t-shirt are rigged, but it is dodgy and suggests that they have been shoddily generated. Those are weirdly designed dice that are rolling. I wouldn't trust them. I just lost 6 straight against a 1. what are the chances of that? i am seeing 0.3% probability. divine intervention is a better explanation than "randomness". Losing 6v1 doesn't even sound uncommon these days. I have lost so many games now due to bad dice its not fun anymore. The dice stats is BS. When I loose turn after turn to either an opponent or a neutral and the dice say I am positive is showing the BS to the dice stats. I have had games now attacking 12 vs 1 and never winning, multiple turns and the dice stats say I'm am hovering between -5 and +5. I have grown very tired of the dice issue. I have lost so much rank its not funny. I might as well sign up for a game and if on the first turn I have bad dice forget about it... The game will be that way the entire time. Something is wrong with the program folks. Fix it. Otherwise why pay for a site that's broken. This is suppose to be entertainment but frustration is not entertainment. If I want to be frustrated I deal with real life issue and get paid for it half the time instead of paying you folks. iAmCaffeine wrote: Losing 6v1 doesn't even sound uncommon these days. caff, to clarify, it was 9v1 -- i lost 6 straight, down to 3v1 and quit. .. and why does it take a computer science degree t post an image on this stupid site! Well, while that is obviously worse, I'm still not surprised. Haha! When you're playing 1v1 bot games and the thing clears the board in the first round, you know you've hit a low on the dice. XD. It's near impossible to lose those games, but there's a small percentage that you can't win no matter what. Especially when it cashes 3 cards every time it gets to 3. It doesn't wipe you out completely for several rounds just to tease you. This is why I don't play 1v1 to be honest. You set up a game, some really terrible opponent joins and goes first going 3v3 against everything in their first turn gaining too much ground for you to gain back. lol. Usually that kind of move never pays off, but when it does... There's no benefit to winning against low ranks because the point reward is so low, but losing is kinda devastating. Poly games are a great invention. It takes this pure luck aspect out of the game. 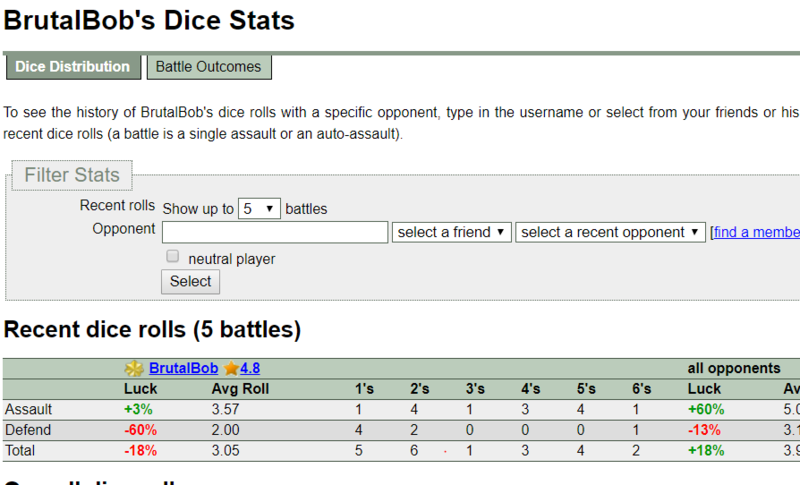 I don't think I've come across a single poly game that I lost because of someone's insane dice on their first turn. It's easier to fight back. Plus, there's the added benefit of very few extremely low ranks actually being premium, so they won't be joining.